The mineral pipeline is part of the Minas-Rio project of Anglo American. The Minas-Rio project involves the extraction of ore in the Sapo and Ferrugem mountains in Minas Gerais, and transformation in the cities of Conceição do Mato Dentro and Alvorada de Minas. The pipeline is 525 kilometers long and takes material to a port in Barra de Açu, in the municipality of São João da Barra, on the coast of Rio de Janeiro. A slurry made up of 70% iron ore and 30% water is transported through the pipeline. The breakages in the pipeline occurred close to each other on 12th and 29th March. The breakages polluted a small river, the Ribeirão Santo Antônio, which supplied water to the town of Santo Antônio do Grama with a population of 4200. The mining company was forced to organise water supply to the town by tanker lorries while an alternative water extraction point was found on another river, the Córrego do Salgado. The second breakage occurred two days after the pipeline was put back in operation after examinations of the pipeline following the first breakage. According to an announcement by IBAMA (the Brazilian Environmental Agency) Anglo American will carry out a detailed inspection of the entire pipeline and the suspension of operation of the pipeline will be maintained until a technical report is published attesting to the safety of the installations and a recovery plan for the polluted areas. The company will be obliged to remove ore that entered the Ribeirão Santo Antônio, and work is already underway with about 200 workers involved. It is claimed that the material deposited in the river is inert. According to local reports, the suspension of activities of the pipeline will create difficulties in meeting deadlines for supplies to international customers and negotiations are underway to change delivery plans. Many staff have been laid off throughout the Minas-Rio project for three months. IBAMA has fined Anglo American £ 15 million for the two breakages of the pipeline. Reports differ about the amount of iron ore slurry released in the two incidents: later reports suggest that 474 tonnes were released on 12th March and 647 tonnes on 29th March. 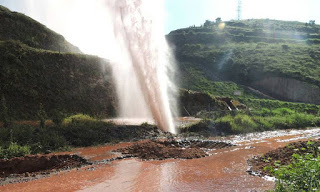 A video is available on the ‘Blog do Roberto Moraes’, showing the iron ore slurry spurting from the pipeline as well as the aftermath of one of the breaks and a map of the pipeline. The website also shows what is claimed to be a piece of the broken pipe: the pipe appears to have burst at the weld along the length of the pipe which is made as part of the manufacture of the pipe. The pipes were manufactured by a Japanese company and in Argentina, and stored in the pipe yards and then distributed to the installation sites. Local reports suggest that some of the pipes may have remained for lengthy period in the storage yards before installation. The pipes used in the pipeline were 12 meters in length, and either 26 inches in diameter in some sections or 24 inches in diameter in other sections. They are carbon steel tubes with polyethylene outer casing of thicknesses ranging from 0.375 inches to 0.906 inches. The pipeline was laid between 2008 and 2014, involving the digging of an open ditch 1.06 m wide and burying the pipe to a depth of at least 0.76 m. Almost 5,000 workers were involved. London Mining Network has been following the progress and impact of the Minas-Rio Project, especially the controversial Phase 3 expansion of the project and its impact in Conceição do Mato Dentro. See LMN’s briefing, published in July 2017.